Off the skin and onto the walls, subversive Galerie d’art Laroche holds high court for group exhibition in collaboration with TattooMania/Prosproduction. Ink has an undeniable permanence: it is a marking which states declaration of the imagination…whether painted on canvas or penetrated into skin. As an affirmation of identity, an indication of memory or even a definition of personal style, the tattoo and its subculture has never been more prominent. Simultaneously iconoclastic and yet faithful to tradition, its presence as a time-honored art form is thriving. 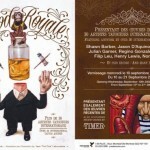 Featuring multi disciplinary works by over thirty notable international tattoo artists, Blood Royale is a dedication to those featured in this exhibition. 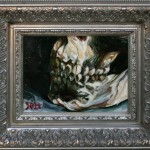 Just in time for the annual Montreal Tattoo Convention, original paintings and drawings by both participating and non-participating artists in the convention will be hung in this invitational exhibit. 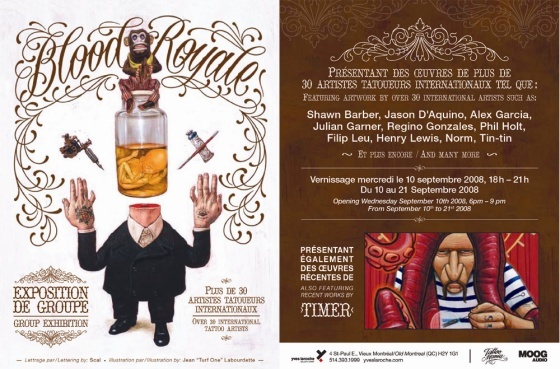 As the third year in collaboration between Galerie d’art Yves Laroche and Tattoomania/Prosproduction, 2008 brings their accord to a new level with Blood Royale. “We like working with the tattoo convention because while working in different areas, we are still linked by being in business run by creative, innovative and professional people, ” says gallery owner Yves Laroche. Like a commissioned portrait of the Renaissance, tattoos have become a personal way to record the eminence of today’s world. Permanent yet ephemeral, the body can be considered a walking canvas in constant evolution. More than fleshy relics, gallery director and curator Ximena Becerra explains the show’s title: “ I wanted a title that embodied everything this show is about- the hard work these artists put in and the idea of elevating their artwork to a higher level. 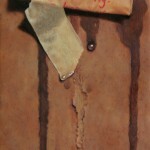 The title is in these artists’ honor.” What act could demonstrate more eminence than tattooing into another’s flesh? From realist to surrealist, each sketch-turned-masterpiece in this commemorative exhibit carries a unique quality contributing to what this exhibition symbolizes. 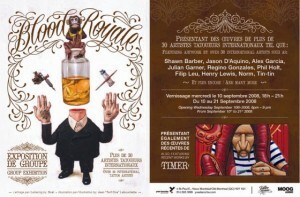 All are invited to the Blood Royale coronation at Galerie d’art Yves Laroche on Wednesday September 10th 2008, from 6-9 pm. Hereafter, the exhibition will be pursued at the annual Montreal Tattoo convention, from September 12th-14th weekend at the Gare Windsor. Amongst the crème de la crème of European, American and local artists will be work by Jason D’Aquino, Regino Gonzales, Filip Leu, Norm, Chris O’Donnell, Tin-tin and many more.